Enjoy immersive audio when watching movies and playing games with these compact speakers. The 2.4 watts of output provide crisp, clear sound, while the USB connectivity allows use with a wide range of devices. 2.4 watts of system power provide clear stereo sound. Compatible with most laptop and desktop computers with a Windows® 7, Windows 8 or Windows 10 operating system. 20Hz to 20KHz frequency range offers deep, booming bass and clear trebles. USB-powered design eliminates the need for power cables. Also includes a 3.5 mm interface for simple connectivity. Lightweight, compact construction enables use in areas where space is limited. 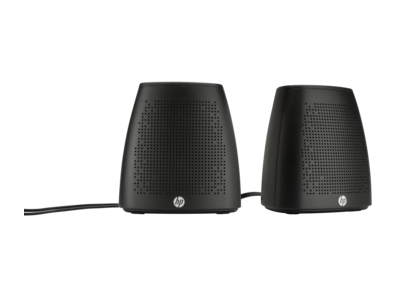 Bring your favorite music, movies, and entertainment to life with HP S3100 Speakers. With superior design and plenty of audio power, your music can truly shine. Get compact, quality sound from a brand you trust, all at one perfect price. The lightweight, compact design allows these speakers to fit nearly anywhere. Turn up the volume with 2.4 watts of clear, crisp stereo sound output. With USB power, you can enjoy your music anywhere, without worrying about where to plug in. Enjoy deep bass and crystal-clear treble with a 20Hz – 20KHz frequency range. The 1.5m cable is compatible with all USB Type A ports, so your music is always within reach. HP includes a one-year limited warranty with online support available 24x7. (2) Consult the HP Customer Support Center for details, or go to www.hp.com/go/orderdocuments. Murka: Makes wierd sound when computer turns on, like a high pitch whoop. Sound is not very good overall. I wouldn't buy them again. Can't return because I bought them with a gift card. Angles51: Will recommend these speakers to a family members and friends. LOAD: For the money this product stands out with it`s clear sound and small size, price tag. EXCELLENT CHOICE??? 1 UL safety testing is not a guarantee of future performance under these test conditions. Any accidental damage requires an optional HP Accidental Damage Protection Care Pack.